Any hope that Athlone Town’s season had taken a turn for the better following their first point in 2018 was truly shattered last Friday night (April 6 ). 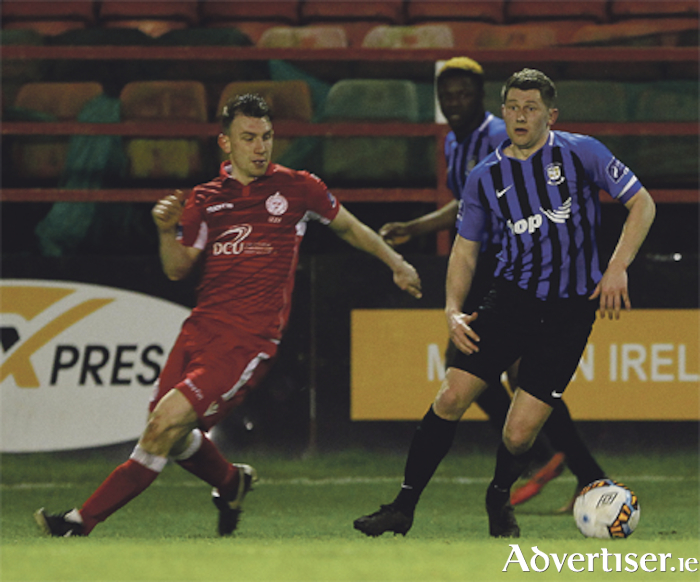 Shelbourne ran riot in Tolka Park, as both David O’Sullivan and Adam Evans helped themselves to hat-tricks in a seven nil trouncing. A week earlier Athlone had drawn with Finn Harps at home, but it is now back to the drawing board for Aaron Callaghan’s team after this latest setback. Shelbourne won all four games between the teams in 2017 and, in the latest instalment, were well on their way to another victory by the half-time break. The floodgates opened once O’Sullivan broke the deadlock after 20 minutes. An attack down the right saw Dayle Rooney denied by goalkeeper Nathan Murphy, but O’Sullivan was on hand to find the net from close range. Goal number two arrived just before the half hour mark, when Murphy failed to gather a right wing cross allowing Evans to head into an unguarded net. Athlone’s first noteworthy attack after 37 minutes came to nothing when Ian Fletchers cross from the left was easily cleared by former Town captain Aidan Collins. The three points were all but wrapped up two minutes later as Evans poked the ball home after being set up by James English. Athlone recovered somewhat and Darren Kavanagh was denied by a fine save from Dean Delaney. The veteran home keeper then punched to safety a Shane Stokes free kick from the right. To add further to the misery, manager Callaghan was dismissed from the dugout just before the break for arguing with the match officials. There was no improvement for Athlone in the second half as Shelbourne added four more scores to their tally. The half was just four minutes old played when the hosts grabbed another goal. English was easily allowed to cross in a low ball from the right, which O’Sullivan swept home from 12 yards. The lead was further stretched when Evans completed his hat-trick just before the hour mark. The last goals of the game came from the penalty spot, both involving Ger Smith and English. O’Sullivan completed his hat-trick with a low finish past the keepers left from the first. The scoring was completed in stoppage time when O’Sullivan sent the keeper the wrong way with another spot kick, after Smith again fouled English. It was goal number nine of the season for the inform striker, who must relish facing Athlone. Last season while with Longford Town, O’Sullivan scored three hat tricks for his then club in the various Midlands derbies.